According to Forrester research online sales will continue to growth through 2015 and will reach $370B by 2017.eMarketer says that number will be $434B with even higher growth rates indicating that future is very bright for ecommerce industry. These statistics are very promising and shows that consumers today are more inclined towards online shopping; causing retailers to think beyond their brick n mortar stores, to gain significant advantage over their competitors. Now the question arises here is “do you have an e-commerce platform integrated with an ERP system? “ Often retailers use an e-commerce platform and ERP system separately, having standalone systems will not serve the purpose. 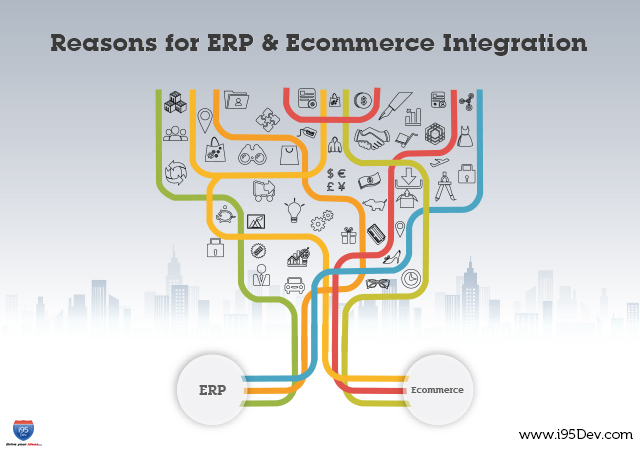 If your ecommerce platform is not integrated with ERP System you will end up in investing a lot of time in manually entering data from multiple channels, making silos of information and tend to miss out on the several benefits of an integrated system. Imagine a situation getting the e-commerce data directly from your ERP system without any human interaction, saving your time n effort. Reduced cost and errors– Imagine a situation where your ecommerce store is generating huge number customer invoices daily and you are transferring all these information manually form an ecommerce store to ERP system which is not only a tedious job but also prone to errors. Integrating your ecommerce store with an ERP system will save your time over money and reduce errors caused because of the manual process. Consistent product Information –Holiday season is almost here, online shoppers tend to shop from multiple channels so it is important for retailers to maintain consistent information across all the channels they are selling through, if your ecommerce store is not integrated with ERP system you will face difficulty in maintaining and updating information regarding your customer, inventory purchase order in two or more systems. Integration helps you in reducing your cost of operations and improves customer experience with your ecommerce store front. Returns management –When a customer returns a product, he /she speaks to a customer service representative who looks up the original bill in the ERP system. After verifying the original bill representative then creates a return merchandise authorization (RMA). The customer sends the product back to the company marked with the RMA number. When the company receives the product, it goes back into inventory and the accounting department gets a notification. Now accounting department can credit the customer and issue a check or an electronic payment.So the warehouse and the accounting department are processing the RMA in the ERP system. This kind of complex workflow is a lot easier to manage when both ecommerce storefront and ERP system are integrated properly; the end result is increased productivity. 360degree view of customer-What a 360-degree view of the customer actually means; 360-degree view is a combination of different kinds of information. There’s personal information, such as name, age, gender, location, etc. Then there are measures of customer engagement, like orders, service requests, cases, etc. Next you’ve got preferences and so-called sentiment. So you’re looking at what a customer’s favorite products are; what kind of feedback the customer provides, whether that feedback is positive or negative, and so on. To get this done , you need to bring in the customer’s business history from the ERP system and look at things like paid bills, amounts spent, returns, credit limit, outstanding invoices, etc. An integrated system makes it much easier to get that kind of comprehensive picture of a customer, so that you can track changes in customer preferences, loyalty and profitability. At i95Dev we just don’t offer you a service or a product; we indeed offer you an experience, an experience of a complete packaged solution that can easily integrate your ERP system with ecommerce. Our packages would drive your sales and revenue and help you in understanding your customer better. For any information from us please reach us at http://www.i95dev.com/contact/ or give us a call at 301.760.7499. We would be more than happy to serve you and help with our expertise to boost your business.